Vekas joins Borderless Access as Associate Vice President and is responsible for business development and sales in Europe. 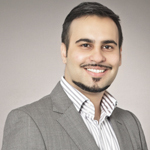 Prior to joining Borderless Access, Vekas was with SSI where he led sales in Melbourne and New Zealand. He specializes in international B2B & Healthcare research and brings over eight years of cross-methodology experience across various data collection agencies including Cross-Tab marketing services and e-Rewards market research. Vekas holds a BA Honours in Politics and Eastern European studies from the University College London.